How do online tournaments work on smash.gg? For online tournaments there are 3 tasks a player needs to do. The Events page is the most important page you’ll be using. You can access it by clicking the Events tab on the left-hand side of the tournament page, then by clicking the View Event button if you are logged in. Upcoming matches will be displayed here. It will include the game, round, your opponent, and most importantly, the time of your match. You should be at this event page at the start of the game to check-in. Once a round starts there is an auto-DQ countdown until you check-in. We recommend a 10-15 minute DQ timer, however this number can be changed by the TO, so it’s best to be on time. After clicking "View Match", a pop-up will appear with Tasks and Chat tabs. Tasks is where you will check-in, set up the game lobby, and reports scores. After checking in, the next task will be to "Join the game lobby". The lobby information displayed will be game dependent. There is also a Chat tab where you have the ability to communicate with your opponent and a moderator. This is a place where you could set up a lobby if it's not already set up, or handle disputes for ruling, scores, etc. 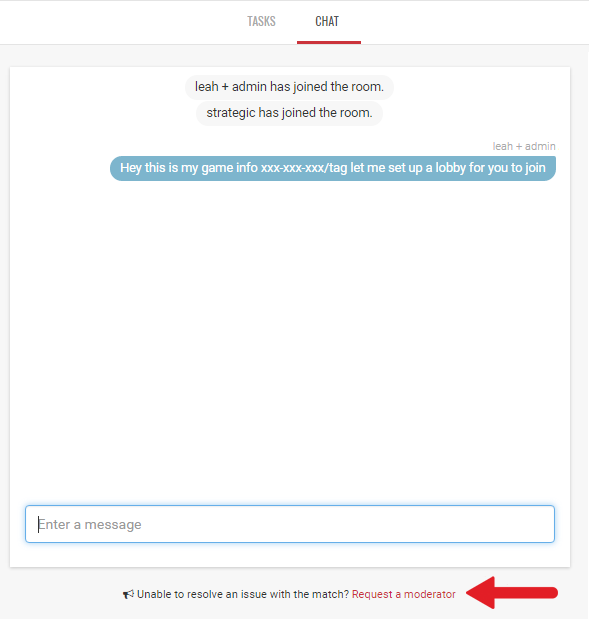 If you cannot resolve an issue, at the bottom of the chat box is a link to request a moderator, this will alert them and they will join the chat when available. 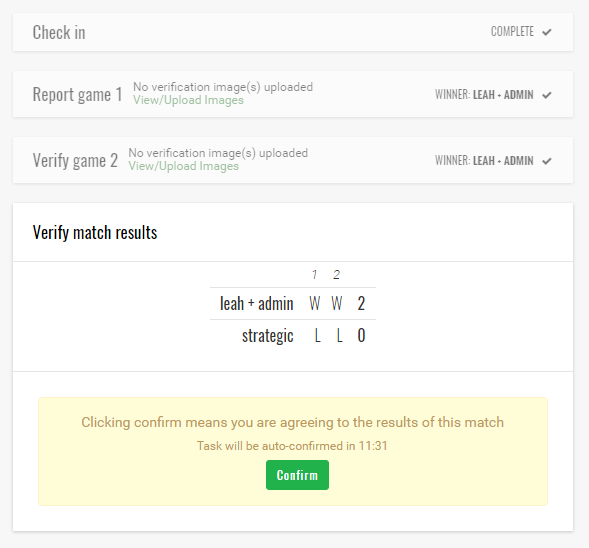 After playing a game, in Tasks you will either report the score and have it confirmed by your opponent or verify your opponent's inputted scores. This goes on until you've completed your match. Then, both players must confirm the final match scores. When inputting scores, you have an option to upload an image. This can be useful if your opponent disputes your reported scores, and vice versa. As you progress through the bracket you must continue to check-in for each of your matches. You can keep track of this on the Events page.